Did it ever happen to you to need a publication-quality drawing of a Feynman diagram for a paper, without finding any easy-to-use interactive tool to produce it? In this case, FeynCAD is likely to be what you were looking for. FeynCAD can be easily interfaced: it inputs/outputs files in a clearly-documented XML format and can be invoked in batch mode without visual interface, making easy its use as a standalone rendering engine for external tools which automatically generate/compute Feynman diagrams. Unfortunately, so far FeynCAD does not help you in deciding which layout is best for your diagram. However, stay tuned: algorithms to make the job are currently being incorporated into FeynCAD architecture, and their introduction will be finished before the final release of Version 1 is shipped. Other relevant examples of what FeynCAD can do appear in FeynCAD manual: in fact, all its figures have been typeset using FeynCAD itself. Here below you find a list of precompiled binaries of FeynCAD; in principle, they should run out-of-the-box on the corresponding platforms (however, please read the Installation instructions below before starting the program). If no package in the list corresponds to your own combination of architecture/operating system, you will have to download the source package instead, trying to compile it by yourself. Trolltech's Qt libraries (version >= 3.3.2) are needed for a successful compilation. In this case, please refer to FeynCAD manual for further details. You need a working installation of MetaPost/TeX/LaTeX in your system to be able to use FeynCAD (like TeTeX, which is usually found in the majority of Linux distributions existing nowadays). Much more detailed instructions about how to install FeynCAD on your computer can be found in FeynCAD manual. 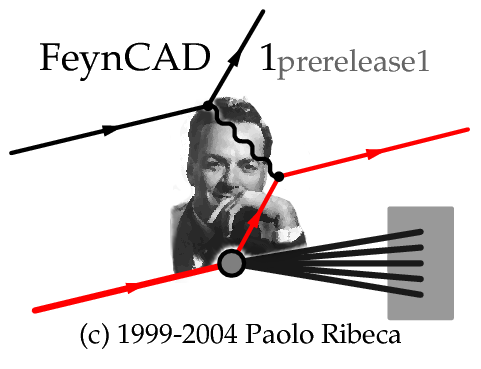 FeynCAD is free software, placed under GNU General Public License. Enjoy it!